Amazon began selling hardcover and paperback books in July 1995. Twelve years later in November 2007, Amazon introduced the Kindle and began selling Kindle books. 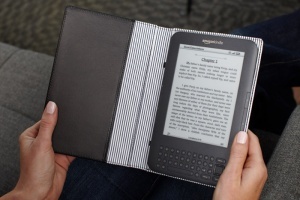 In July 2010, Kindle book sales had surpassed hardcover book sales. In January 2011, Kindle books overtook paperback books to become the most popular format on Amazon.com. Now, less than four years after introducing Kindle books, Amazon customers are purchasing more Kindle books than all print books combined. Since April 1, for every 100 print books sold on Amazon.com, 105 Kindle books have been sold. This includes sales of hardcover and paperback books by Amazon where there is no Kindle edition. Free Kindle books are excluded (if included the number would of course be even higher). So far in 2011, the tremendous growth of Kindle book sales, combined with the continued growth in Amazon's print book sales, have resulted in the fastest year-over-year growth rate for Amazon's US books business, in both units and dollars, in over 10 years. This includes books in all formats, print and digital, and once again free books are excluded in the calculation of growth rates. Furthermore, actual device sales are also very high. Amazon sold more than three times as many Kindle books so far in 2011 as it did during the same period in 2010. The US Kindle Store now has more than 950,000 books (175,000+ were added to in the last five months), including New Releases and 109 of 111 New York Times Best Sellers. Over 790,000 of these books are $10 or less, including 69 New York Times Best Sellers. Millions of free, out-of-copyright, pre-1923 books are also available to read on Kindle devices. "Customers are now choosing Kindle books more often than print books," Jeff Bezos, Founder and CEO of Amazon.com, said in a statement. "We had high hopes that this would happen eventually, but we never imagined it would happen this quickly - we've been selling print books for 15 years and Kindle books for less than four years. In addition, we're excited by the response to Kindle with Special Offers for only $114, which has quickly become the bestselling member of the Kindle family. We continue to receive positive comments from customers on the low $114 price and the money-saving special offers. We're grateful to our customers for continuing to make Kindle the bestselling e-reader in the world and the Kindle Store the most popular e-bookstore in the world."